This blog has been sitting here for quite a while. It’s something I set up to play around with back when I was in college… I made a few posts related to stuff I was working on, and then it just sat idle for the next 7 years. Now, taking a look at how the blog has performed over those 7 years, I am starting to get curious. Will additional posts garner similar traffic? Will more posts mean an even higher rate of search engine traffic per post, as the higher amount of general traffic increases the general search engine ranking and popularity of the site? While Google Analytics has stored all of my data over time (because I tied the blog to GA when I first set it up), unfortunately Webmaster Tools has not. It seems that at some point in the past 7 years Webmaster Tools switched to only retaining the past 90 days of data. Supposedly, linking Webmaster Tools to my GA account (which I have done now) will solve this problem going forward – we’ll see. For now I will download the data occasionally from Webmaster Tools to archive it, just in case. Here is the data I do have for the google search results. For that period of 90 days, there were roughly 32k impressions – which would be an average of roughly 355 daily. To try to extrapolate this data over the past 7 years for which I don’t have data, I’m just going to use the CTR (click through rate) shown here. 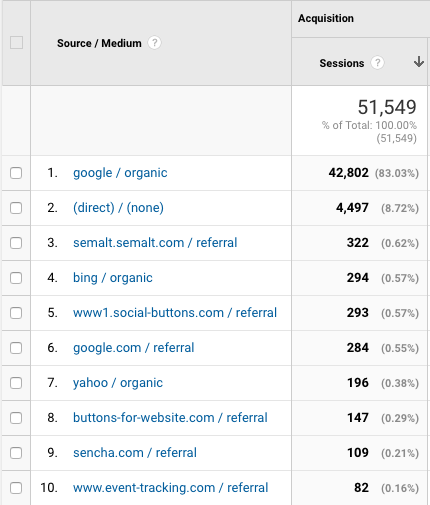 Going back to Jan 1, 2010, there were 42,802 users referred to the site through google search. Using the same CTR, that would be roughly 3.2 million impressions. The majority of that was sent to two posts – I assume because those two posts have some generally useful content. So, now the problem just comes down to content. Daily posts will be a daunting task, even with some source of content. In order to make this a bit easier on myself (and raise the odds of it actually getting done), the majority of the posts are going to be filled hints and information related to web development – specifically, the stuff I come across daily that gives me trouble. I figure if it takes me a couple hours of searching to find an answer to, then there needs to be an easier source. So why not this blog? I’ll fill each “Daily Grind” post with the stuff I found most useful each day. If I don’t find anything new and particularly useful that day, I have plenty of tips and tricks from the past 10 years to contribute. Cheers.